Hakusan, Japan, September 20, 2018 – EIZO Corporation (TSE: 6737) today announced that 22 new paper types from manufacturers Hahnemühle, SIHL, and Tecco are now supported in Quick Color Match screen-to-print color matching software. 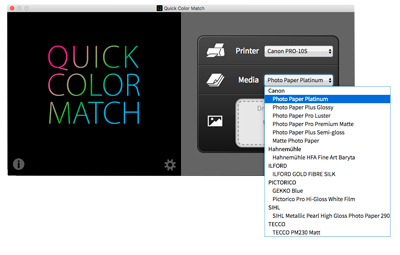 Quick Color Match was announced in September 2016 with support for 13 different papers from Canon and Epson to achieve a smooth workflow when using printers of the same brand. With support for additional papers by Hahnemühle, SIHL, and Tecco, along with previously announced paper manufacturers ILFORD and Pictorico, Quick Color Match now supports a total of 48 papers from 7 manufacturers. The solution continues to ensure photographers using a range of different media can benefit from a simplified CMS (color management system). Quick Color Match version 2.1.2 is now available as a free download. See the EIZO global website for hardware and software compatibility details.